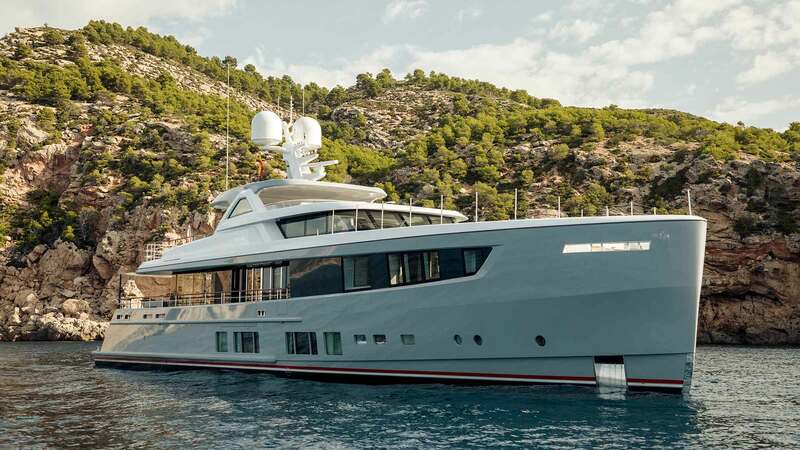 Modern all-aluminium motor yacht DELTA ONE (ex.BN 105) is the first hull in the Mulder ThirtySix series and was built by Dutch shipyard Mulder with a launch in 2017. 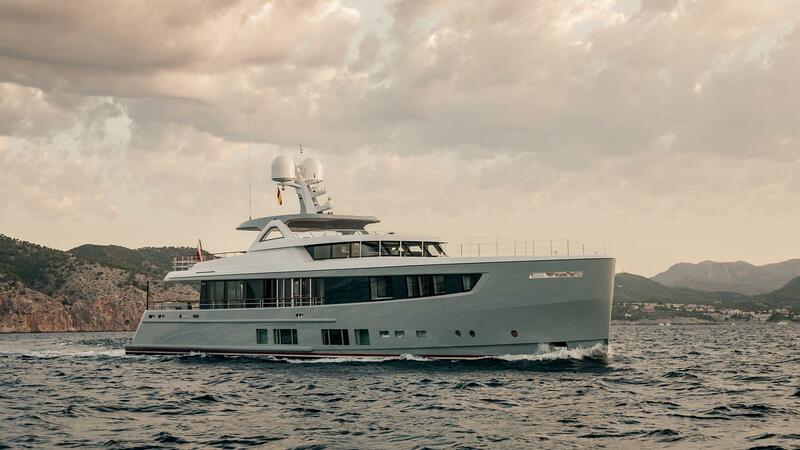 Her design features a plumb bow, large square windows in the hull and a raised pilothouse with naval architecture from Van Oossanen and the exterior and interior styling by Claydon Reeves with Vickers Studio also collaborating on the interiors. 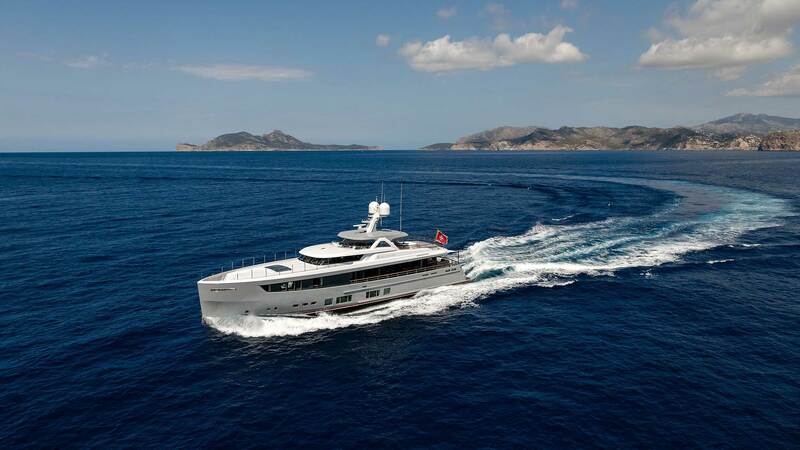 The accommodation sleeps up to 10 guests over five en-suite cabins with a crew of five for excellent service. 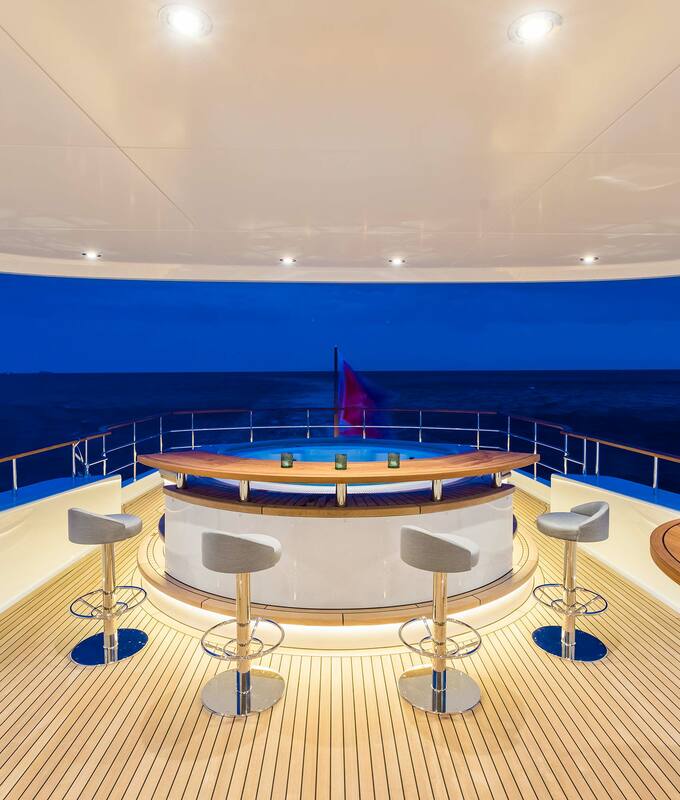 The main deck aft cockpit provides a large shaded alfresco dining area and lounge with two L-shaped sofas coupled with large drinks tables facing forward. 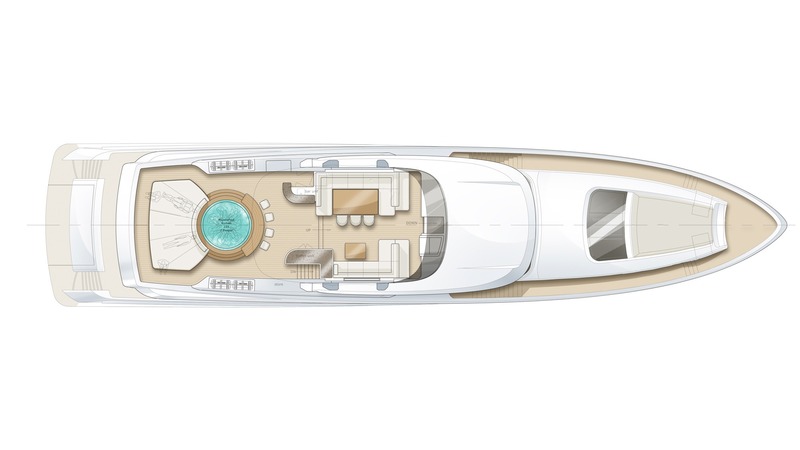 Staircases connect to the swim platform and beach club below, while port and starboard walkways will take guests past the fold-down terrace beside the formal dining area and up to the sunbed on the foredeck and a loveseat on the bow. 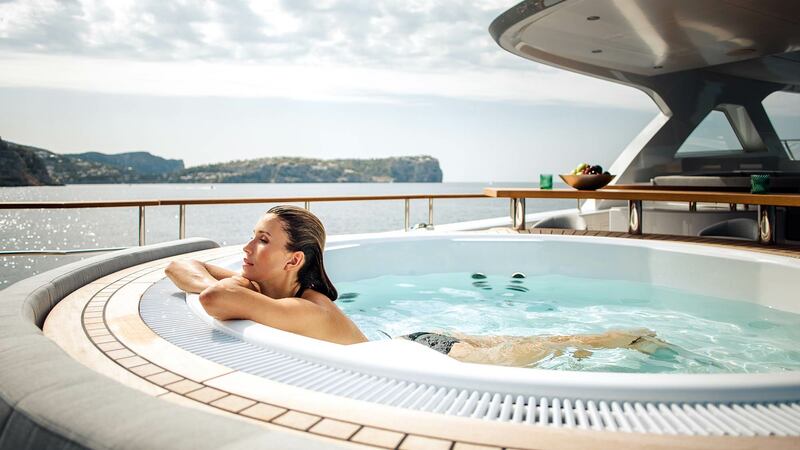 The bridge deck centrepiece is the Jacuzzi to the aft which features a swim-up bar and a massive sunpad to the stern. 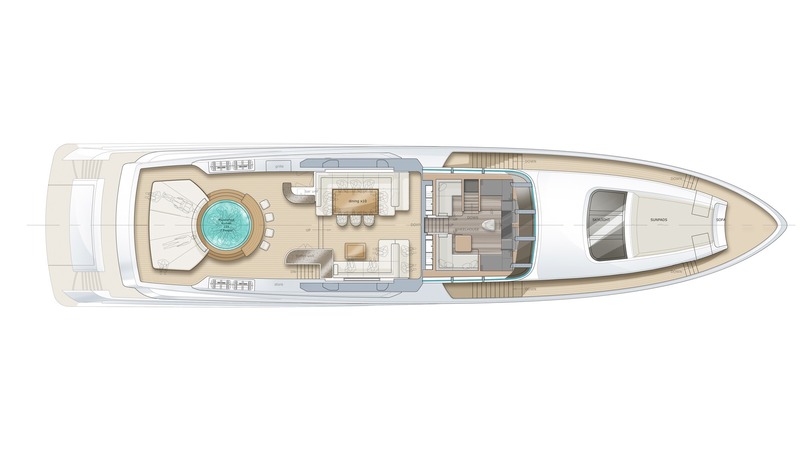 The raised central section beneath the hardtop hosts a port C-shaped sofa with an alfresco dining table, and an L-shaped sofa and drinks table opposite. 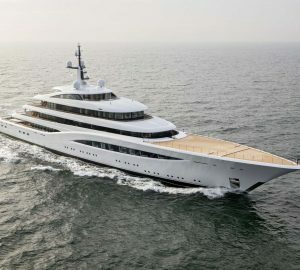 The forward staircase leads down into the bridge, which becomes another interior salon while at anchor. 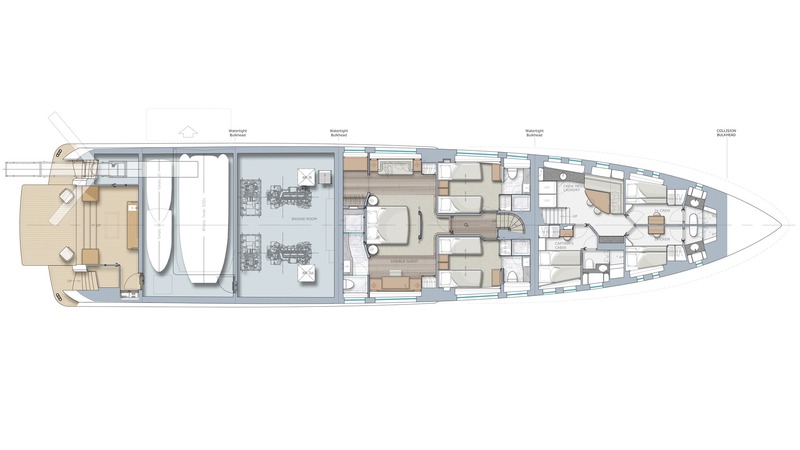 The lower deck layout is comprised of the crew accommodation and mess in the bow, with a separate staircase for access to the amidships guest accommodation. 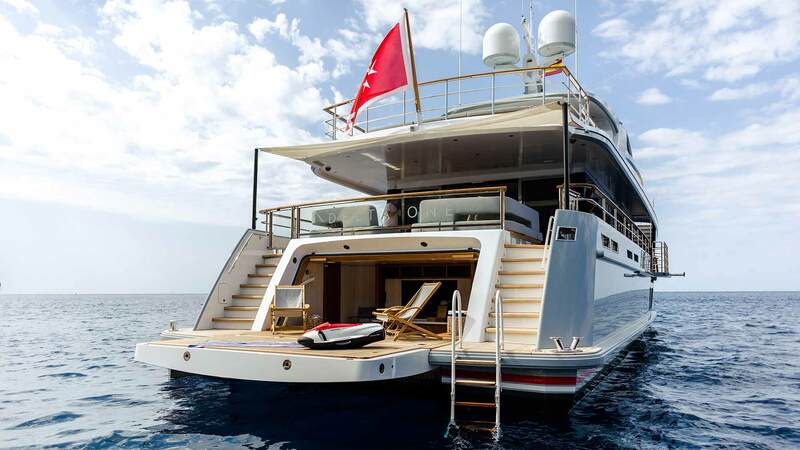 Aft of amidships is the engine room followed by the side-loading tender garage and the beach club with a wet bear in the stern. 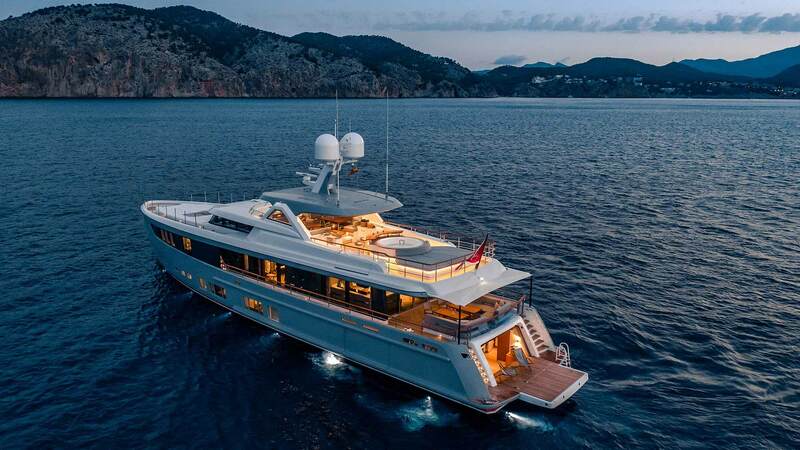 On the main deck, the forward full-beam Master suite provides a tranquil retreat with day beds beside the windows, a spacious forward bathroom and an office/study where guest have access to a large wardrobe. 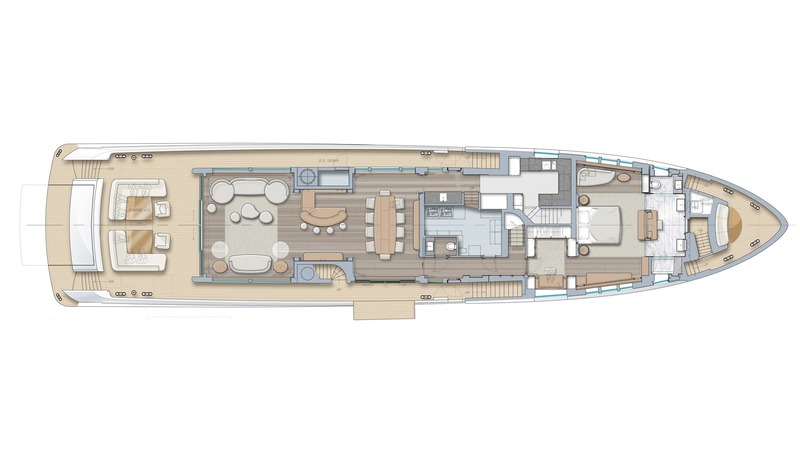 The main deck salon contains a formal dining area forward to seat 10 guests and a wet bar with four seats divides the social spaces, placing the lounge to the aft. 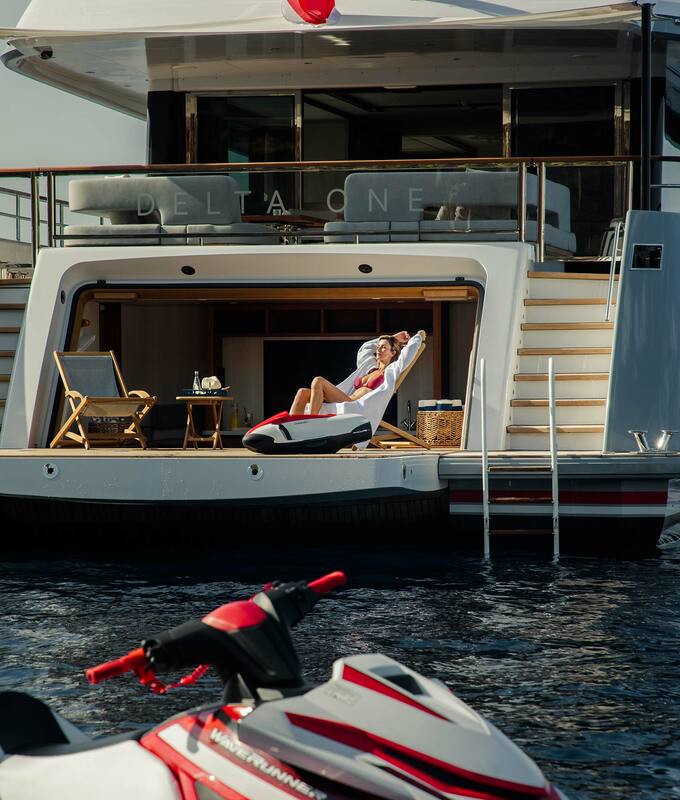 The port sofa can also be used as a day bed and a second sofa is placed opposite. 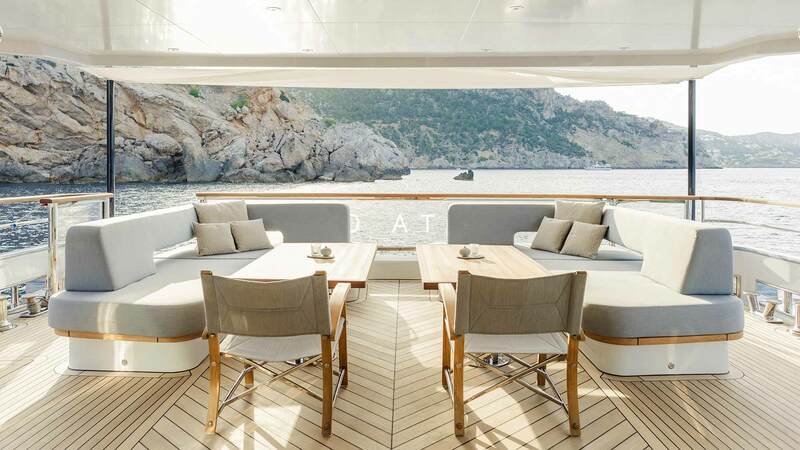 The port corridor passes the formal dining area to a staircase to the bridge, and guests can pass through and use the stairs to the bridge deck alfresco lounge or relax on the corner sofas, resting drinks on the table and taking in the forward views. 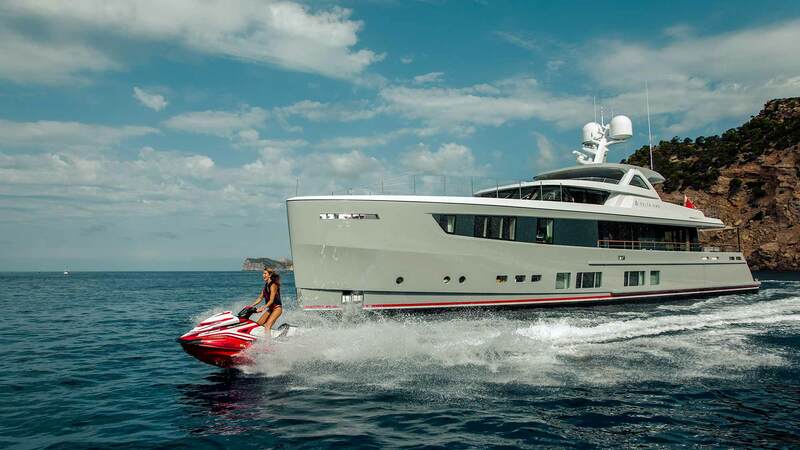 A pair of Caterpillar C-18 diesel engines produces 1,136 HP for a top speed of 17 knots and a cruising speed of 15 knots. 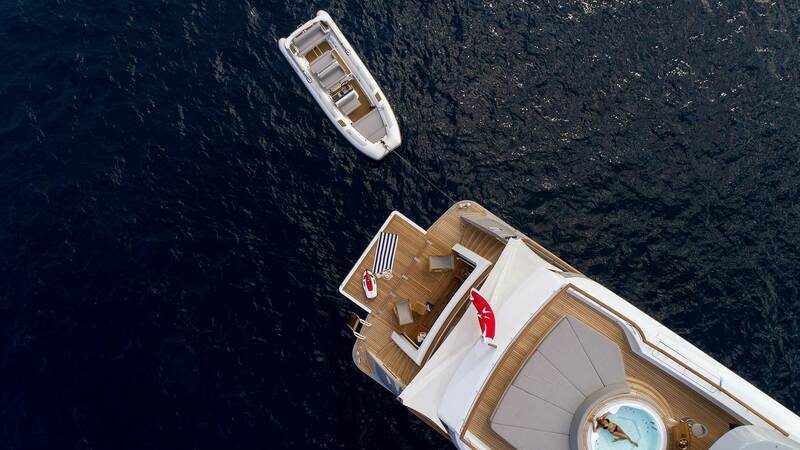 The accommodation sleeps up to 10 guests over 5 en-suite cabins: 1 Master suite and 4 further guest cabins. 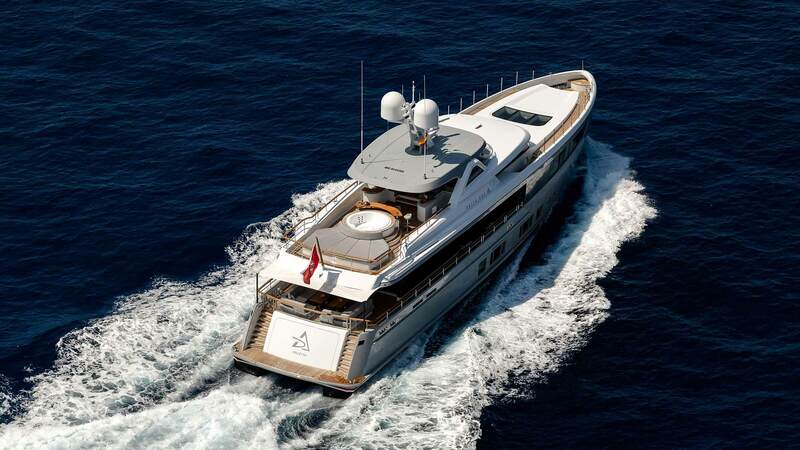 We do have available further amenity, owner and price information for the 36.0m (118'1") yacht DELTA ONE, so please enquire for more information.